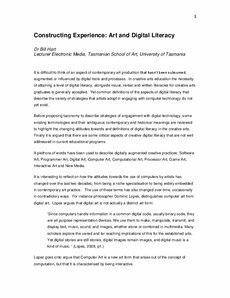 Discussing digital literacy within the context of the creative arts is made complex and confusing by both the plethora of labels used, and the sometimes ambiguous or contradictory ways in which they can be applied. For instance Software Art may refer to an artist engaging in a cultural critique of software, or one who uses the formal structures of a programming language as a variant of concrete poetry. Computer Art is at best seen as a marginally rehabilitated historical movement that nobody seems to want to claim as an antecedent, while mainstream Digital Art has come to mean what we used to call Video. This taxonomic confusion masks a range of strategies that artist adopt, ranging from art made with technology or art made about technology. Commonly software tools are used to shape and manipulate digital media as an outcome, but alternative practises can result in a software executable, as an art object. This paper sketches out a taxonomy of creative approaches to digital technology in relation to definitions and labels currently used to describe these practices. It then focuses on why the software executable as an art object deserves attention, and finally it articulates the challenge for creative arts education to incorporate these insights towards an engagement with technology that addresses a full gamut of digital literacy.